-Trio’s 3 feet is integrated into its main frame. This will not only provide a great stability, but there are no loose parts during set-up. 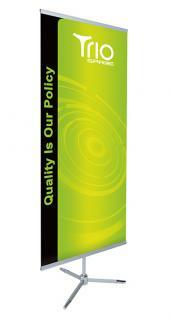 -Allows single sided or double sided display. -Apart from its standard width range of 500mm, 600mm, 700mm, 800mm and 1000mm, we also welcome any customized widths. -Trio comes with our snap profiles, which enables user to change graphic quickly and easily. This snap profile is also compatible with a wide variety of media.